This blog received more than 2 million clicks in January 2007, when Ashley's story went viral worldwide. We appreciate your interest in our daughter’s story, which we share for the benefit of other families who might bring similar quality of life improvements to their Pillow Angels. Ashley's scoliosis continues to be stable for the last 10 years! Details about Ashley's condition & the treatment: article on the "Ashley Treatment" & a one slide summary. 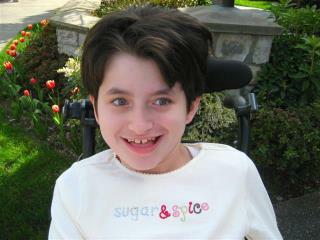 More photos of our beautiful angel: Ashley along the years and Ashley in 2007; also, medical photos. Reaction from others: the testimonies section and the support section. Also, a section for general updates and a section with references and media coverage. Just learned that our sweet Peter is finished with the growth attenuation treatment! His current bone age is at 16 years, his height is 4’6”, his weight is 60 pounds, and he is 9 years old. In August 2013 we would have hit our three year mark for starting the treatment. The Dr. said at 16 bone age he could still experience 2% more growth, but she wants us to end the therapy now. She wants to follow up in 6-12 months. WE ARE FINISHED and I am so excited and extremely grateful!!! Everytime I look at my 15 year old son who is towering over me at almost 6’4”, I am so thankful we learned about the treatment for children like Peter and went forward when we did. Wish we could have started earlier, but 60 pounds is very ‘doable’. Thank you, AD [Ashley's Dad], for all you have done to make this possible! How do we get the word out more so that parents have the choice? So many still do not know about it, it is sad. They find out when it is too late. Anyway, I hope you, your family, and sweet Ashley are all doing well! a very happy mom of a pillowangel! This is a wonderful interview. So genuine. Your parental love is strong, transparent and inspiring. "The articles still cause me amazement that anyone would criticize this or us. The love and desire to care for our own kids and give them the comforts they enjoy as small people, seems like the least we all could do for them. ... So if loving to see my boy who can't eat or drink, sit, crawl or walk in his swing laughing and giggling and clapping his hands makes me a bad parent then I'm totally cool with that!" "What a wonderful innovative solution to a heartbreaking situation. Ashley is extremely fortunate to have been born in such a loving family. All the best to you!" "Your story is very moving and touching. The love you have for your daughter is very evident in everything you have done. You have given a public light to an unseen set of issues in our society and done so with courage and the best interests of your daughter. Unlike many of your other supporters I do not have experience with a 'pillow angel' but understand the blessing I have in my four healthy children. I would like to think I would have been as courageous as you have, but have my doubts. You and your beautiful Ashley are in my prayers and I wish you all the best for a full life with your daughter. Thank you for sharing your story with all of us, and for doing what was right for this little girl. Thank you also for pointing out the Smile Train and the works they do, I will be making a small donation in the name of your daughter." "I want to thank you for pioneering this treatment to aid all the pillow angels out there in the world today. As a pediatric nurse practitioner I cannot express the sheer horror of watching children grow into adults and have their parents try to move them. I take care of a 17 y.o. male with bilateral femoral and tibia fractures (large bones in both legs) from turning him in bed. He weighs close to 200 lbs. Surgery to repair is not an option as he would never come off the ventilator. I have another patient who is non-verbal with severe fetal alcohol syndrome. When her menses come she screams, will not let you put pads on her and throws the discharge at caregivers. She cannot have Depo because of bone loss risks and we have been unable to stabilize her cycle with the pill. I think if those people who are appalled by the treatment would come and see the children in institutions, developing sores because they are so hard to turn, listen to the parents talk who had to put their children in a institution because they could not care for them at home, and would see the bedridden children/adults who are raped and then die during childbirth, the argument would cease. Thank you for publicizing your treatment. I am hopeful that someday we may offer more pillow angels this same gift and allow them to stay at home with the people that love them." Ashley's text and photo material is copyrighted. We hereby grant permission to use Ashley's photos and to quote from this web site and article as long as you clearly credit the site and include the following link: http://www.pillowangel.org. Printing copies of the article for personal or educational use is permitted, we suggest a donation to The Smile Train per below. Please email us for any other usage. If you feel touched by Ashley's story and want to aid vulnerable children we strongly recommend a donation to The Smile Train. It is the fruition of an amazing act of volunteerism that improves the lives of tens of thousands of children worldwide who are born with cleft lips.